Zoey Benally featured at Arroyo’s Sept. 2nd at 6 p.m. 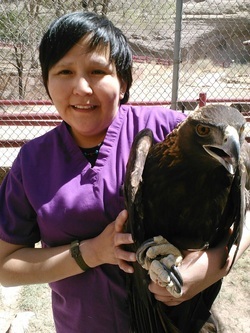 The Telluride Institute’s Talking Gourds Poetry Club for Tuesday, Sept. 2nd features Dr. Zoey Benally, a performance poet, veterinarian and professor at Navajo Technical College in Crownpoint on the Navajo Nation. Zoey has been a Talking Gourds poet/performer many times over the last few years. At the Karen Chamberlain Poetry Festival in Carbondale earlier this year, a few of us got to hear her do her wildly political piece, Navajo Zombie Apocalypse. Expect more than sheep and scarred buttes from this performance powerhouse. With this September gathering, the Club will go back to its normal 6 p.m. time slot on the first Tuesday of every month for the rest of the year.